, an eminent mathematician, was born at Salisbury, on the 29th of May, 1675, being the fourteenth of that name in a direct line. His father was a gentleman possessed of a small estate in the county of Wilts. His mother was of the family of the Luttrells of Dunstercastle, near Taunton, in Somersetshire, whose fortune made a considerable increase to the family income. Mr. Ditton’s father being of the sect of nonconformists, and extremely tenacious of his opinions, entered much into the religious controversifs of those times, and in supporting such contentions impaired his fortune, almost to the ruin of his family. Mr. Humphrey Ditton was the only son; and his father, observing in him an extraordinary good capacity, was desirous that he should not want the advantage of a good education. 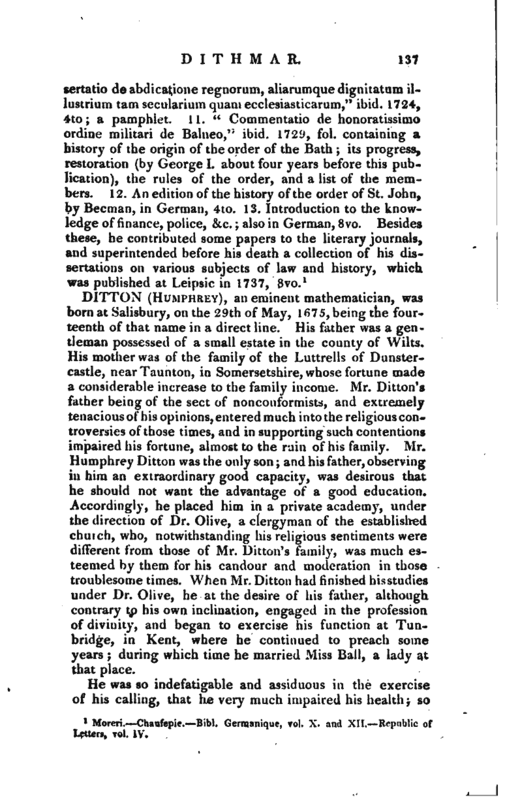 Accordingly, he placed him in a private academy, under the direction of Dr. Olive, a clergyman of the established church, who, notwithstanding his religious sentiments were different from those of Mr. Ditton’s family, was much esteemed by them for his candour and moderation in those troublesome times. When Mr. Ditton had finished his studies under Dr. Olive, he at the desire of his father, although contrary to his own inclination, engaged in the professioa of divinity, and began to exercise his function at Tunbridge, in Kent, where he continued to preach some years during which time he married Miss Ball, a lady at that place. He was so indefatigable and assiduous in the exercise of his calling, that he very much impaired his health; so | that several of his friends foreseeing it would shorten his life, advised him to relinquish a profession which the weakness of his constitution could not support. 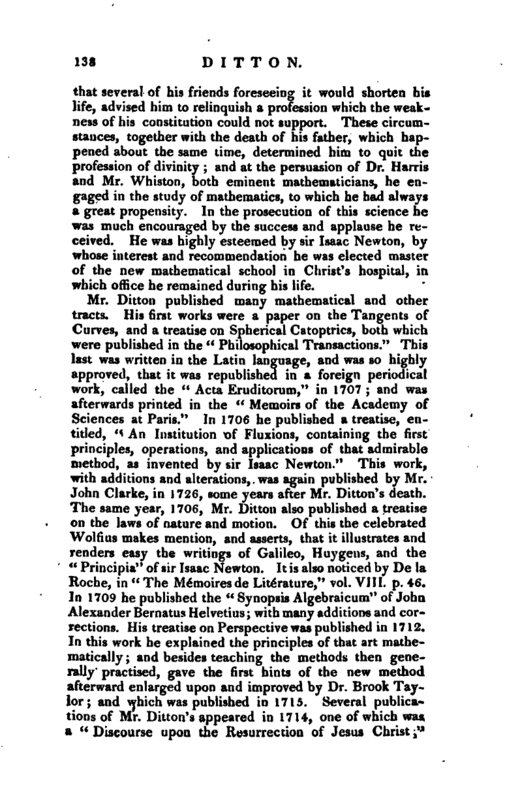 These circumstances, together with the death of his father, which happened about the same time, determined him to quit the profession of divinity and at the persuasion of Dr. Harris and Mr. Whiston, both eminent mathematicians, he engaged in the study of mathematics, to which he had always a great propensity. In the prosecution of this science he was much encouraged by the success and applause he received. He was highly esteemed by sir Isaac Newton, by whose interest and recommendation he was elected master of the new mathematical school in Christ’s hospital, in which office he remained during his life. a great circle, or 60 geographical miles; 15,000l. if it determines the same to two-thirds of that distance; and 20.000l. if it determines it to half that distance; with other regulations and encouragements. So in the Biographia Britannica, which does not give us the date of this German translation. There was a German translation published in 1720, by Cornelius Coorn, which might have a life of Ditton prefixed to it, but in 1746, Whiston informs us that he wrote a life of his friend, to be prefixed to a German edition then in the press, and in which he would not have asserted what is here contradicted. 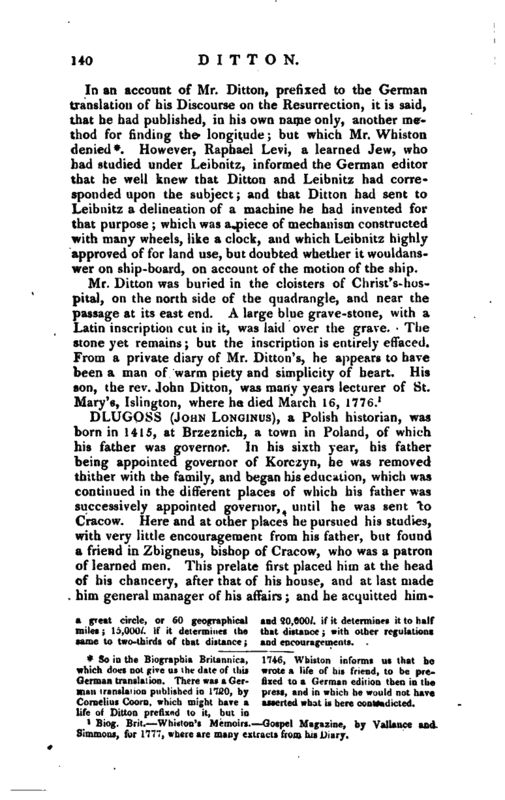 However, Raphael Levi, a learned Jew, who bad studied under Leibnitz, informed the German editor that he well knew that Ditton and Leibnitz hud corresponded upon the subject; and that Ditton had sent to Leibnitz a delineation of a machine he had invented that purpose; which was a piece of mechanism con with many wheels, like a clock, and which Leibnitz highly approved of for land use, but doubted whether it wouldanswer on ship-board, on account of the motion of the ship. Biog. Brit. Whiston’s Memoirs. 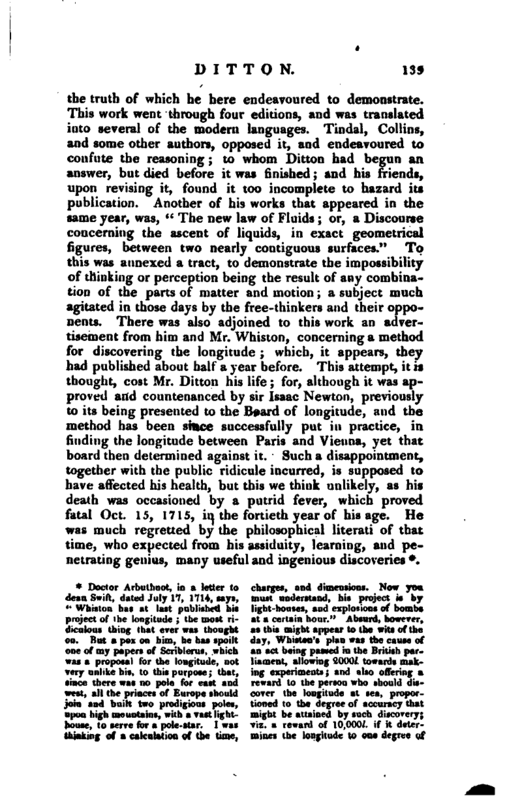 Gospel Magazine, by Vallance and Simmons, for 1777, where are many extracts from his Diary.